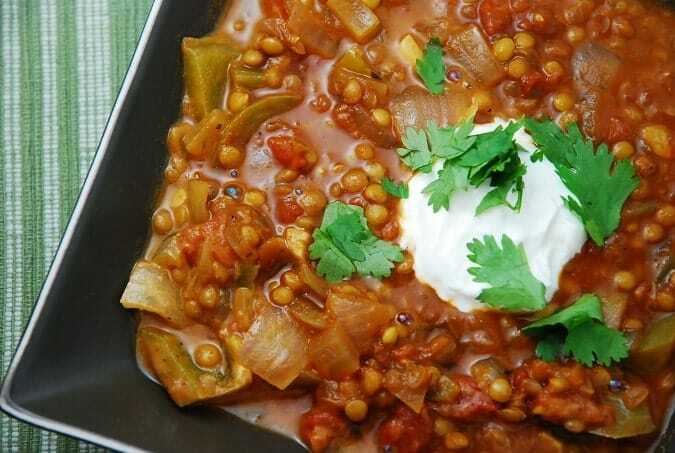 With the chilly fall weather in full swing, it’s time to warm up your belly with this hearty, savory and ridiculously healthy Lentil Chili Recipe. Using lentils as the protein source in place of meat and beans, it’s wonderful vegetarian chili that is incredibly satisfying, tremendously flavorful. Lentils have a TON of protein and fiber, so this chili is very filling. And lentils also don’t require soaking, so you can literally toss everything into one pot, and it’s ready in less than an hour. I almost always have all of these ingredients on hand, so it’s perfect for when I want to whip up a quick weekend lunch to serve with our leftover Challah bread from Friday night dinner. I also like to make big batches of this, then freeze and store individual portions so I have something Weight Watchers friendly on hand when I need a quick lunch or dinner. It’s truly a fantastic vegetarian chili recipe that is so good, you won’t even miss the meat. I topped mine with a bit of sour cream and fresh cilantro for garnish…yum! Zesty, filling, and meat free, this Lentil Chili is a perfect vegetarian alternative to traditional chili. It’s incredibly easy to make and most ingredients are probably in your pantry. It’s a warm and hearty Weight Watchers chili recipe that will fill you up. Spray a large pot or Dutch oven with cooking spray or an olive oil mister and set over medium high heat. Add in onions and garlic and sauté until onions are tender, about 3 minutes. Stir in remaining ingredients , and bring to a boil. Then reduce heat to low and simmer for about 30-45 minutes.